I am delighted to be here today to mark the 54th anniversary of the Independence of Sierra Leone. As you will all know or imagine, we did not have any commemoration events this year in Freetown because of the Ebola restrictions. But even as we help Sierra Leone to start to recover from this devastating epidemic, we need to keep the big and long-term picture of Sierra Leone as a nation in mind. 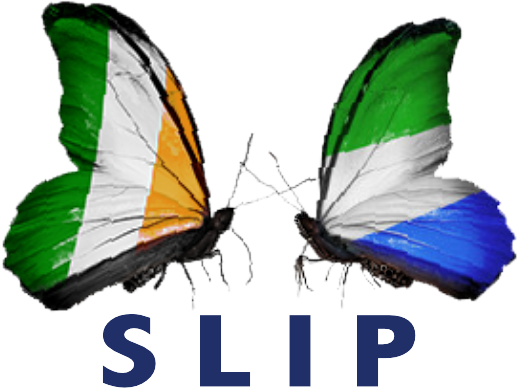 So I think it is great that, as usual, the Sierra Leone Irish Partnership is keeping the awareness of Sierra Leone high within Ireland with this wonderful event, as SLIP has been doing consistently and doggedly since its formation in 1991. That is really the first thing I wanted to say this evening, that this group, that brings together Sierra Leoneans living in Ireland and Irish people with a commitment to Sierra Leone is a huge asset to me and my colleagues as we go about our work at the Irish Embassy in Freetown. The way that SLIP keeps Sierra Leone in the press, keeps the public and public representatives aware and engaged, as well as the platform you provide for various organisations and initiatives to support Sierra Leone is invaluable. And, along with the Liberia Solidarity Group which I also work closely with, it is unique. I am not aware of any other group doing what you and LSC are doing. And if I think of how, Sierra Leone was upgraded to one of Irish Aid’s nine top priority countries worldwide in 2013, and how our office was upgraded to a full embassy in 2014, I can only think that SLIP played a very significant role in making this happen. And also the work that members of SLIP in Ireland and in Sierra Leone have done over the years, with missionary organisations, NGOs etc. has laid the foundation for the increased Irish government presence. -What is going on with Ebola at the moment? -What has the Irish engagement on Ebola been over the past year? -What next for Sierra Leone and how will Ireland support this? Although I am also very aware that for all of you here, especially the children, and most especially the children from my own family, Usifu Jalloh, the Cowfoot Prince is really the main attraction of the evening so I will try not to keep him from you for too long! So what is happening with Ebola. I think I would summarise by saying that we are nearly there, but the tail end is likely to still take a while. To provide some context, there have been, to date, just under 27000 confirmed cases of Ebola reported globally. The vast majority of these infections have been in Sierra Leone, Guinea and Liberia. The virus has taken the lives of 11125 people. In Sierra Leone alone, 12,666 people have had Ebola, and 3907 of these have died. The latest figures suggest that over 9000 children have lost one or both parents. Tragically, of these 221 of the people who died in Sierra Leone were health workers. I would like to pay tribute to these individuals this evening. These local health care professionals in many cases acted as first responders to the crisis and sadly lost their own lives in trying to save the lives of others. Liberia was declared free of Ebola on 9th May, but the situation remains serious in both Sierra Leone, with 8 cases last week, and Guinea, with 27, and most of those near the Sierra Leone border. Having said that, Sierra Leone has made huge progress to get to where it is now, and went 8 days recently with no cases, but there are still three parts of the country—one slum in Freetown, and small areas with Kambia and Port Loko where there are still cases. The key priority at this time is to ensure that the high level of resources, human, technical and material, which have been built up in Sierra Leone, are maintained until the number of cases reaches zero. I am confident that we will get to zero and that it will happen soon, but we need to stay the course. So what has Ireland been doing on Ebola? I am happy to report that Ireland has been centrally engaged in providing support to the Ebola response since the outbreak’s onset last year. Minister of State, Seán Sherlock, was the first European Minister, in fact the first politician of any kind, to visit Sierra Leone during the Ebola crisis when he came to Freetown in October. This visit sent an important message of solidarity that was actually remarked upon by Dr. Ernest Bai Koroma, when he met Minister Sherlock on that visit. Since the beginning of the Ebola outbreak, Ireland has provided over €18.5 million to the affected countries in West Africa, both directly and through NGOs. We provided funding of over €6 million to assist with the construction of Ebola treatment facilities in both Sierra Leone and Liberia, as well as for key activities such as contact tracing and social mobilisation. This figure includes 42 tonnes of humanitarian stocks air-lifted to Sierra Leone and distributed to Ebola-affected households. It also includes a contribution of €1 million to the UN Ebola Response Trust Fund established by the UN Secretary General in September. But I want to stress here that Ireland’s contribution to the Ebola response is not only financial by any means. Ireland is one of only three EU member states with an Embassy and aid programme in Sierra Leone. We opened an Irish Aid office in 2005, and as I mentioned earlier, the office was upgraded to a full Embassy in January of last year—and has obviously had quite the baptism of fire! Since the outbreak began in Sierra Leone in late-May, from the Embassy we have played a key role in policy and coordination of the response. As everybody here will know, this outbreak was entirely unprecedented in global terms. For the first several weeks the governments and the international community did not know what to do. But we hung in there as Ireland in those uncertain times, and we helped to try to figure it out. Through our colleagues at headquarters and in other key missions such as Geneva, New York and Brussels, we helped to raise awareness of the enormous need for global support. In our work on the ground, we are leading on some key elements of the response, such as fleet management for ambulances, food supply and emergency nutrition. But our team working on the Ebola response in West Africa does not stop with the Department of Foreign Affairs and Trade, we were extremely fortunate since November to have a team of Defence Forces personnel, 15 in all: six individuals who have worked with the Embassy at various stages over the past few months including two currently with us, and 9 serving under the UK Joint Taskforce on Ebola (5 who just left and 4 who have just arrived). These fifteen men have been an amazing example of what a cross-governmental contribution on Ebola can and should look like. One of the tasks of the Defence Force personnel is to provide technical support to Concern and Goal, and I would also like to highlight these organisations for the huge contribution that they are making through running treatment centres, organising safe burials and so many other activities. These organisations have stepped up and entered into new areas where they previously had little expertise and I am very proud of them for that. They are joined by many other organisations with offices in Ireland such as Trócaire, MSF, Red Cross, Plan, Oxfam, World Vision, Christian Aid and so on which are doing excellent work on various aspects of the response. And let’s not forget the missionaries. Individuals such as Sister Mary Sweeney in Makeni has been making outstanding contributions, as they have done for so many years. And finally, our team from Ireland working on Ebola in West Africa also includes the many individuals, from the HSE and others, who have gone to volunteer for various organisations. So many lives have been and continue to be lost in this crisis but many have also been saved. This is in no small part due to the perseverance of many individuals, and I am very proud to say that a disproportionate number of these are Irish. So through our people, as well as through our funds, we are helping to defeat the Ebola virus. But even as we come close to defeating Ebola, the remaining challenges are enormous. Everybody here will be aware that the Ebola crisis itself is only one of the killers in Sierra Leone this year. In Sierra Leone, for example, recent statistics predict a 20% increase in infant mortality due to the Ebola outbreak. Most of these children are not dying from Ebola, but from the fact that they cannot access adequate healthcare from the regular health system due to the impact of Ebola on the system. A 20% increase in infant mortality in a country where already one in five children dies before the age of five is a crisis all to itself. One statistic I looked up a while ago is that for every 1 doctor in Sierra Leone, you had 160 doctors in Ireland. And that was before Ebola, but now 10% of those doctors have died of Ebola. So the situation is even worse. We need to find ways to train large numbers of health workers in Sierra Leone first to replace the 220 health workers who have died so far, and then to actually get proper ratios of doctors to patients in the long-term. But of course we also have to simultaneously get the rest of the health system to work, the infrastructure, the pharmaceutical supply system and so on. And all in the poorest countries in the world. It is pretty daunting. But it is absolutely urgent. In 2014, some €10 million was provided by the Irish government for our annual development programmes in our partner countries, Sierra Leone and Liberia and a primary focus of our programmes in these countries is on health system strengthening. This year our annual budget is up by 40% as we try to combat some of these secondary impacts of Ebola as well as the long-term challenges. The secondary crisis in these countries caused by Ebola goes far beyond the health system however. Farmers’ incomes have plummeted. Hundreds of thousands of jobs have been lost as the economies of the sub-region have been badly hit. Children have lost a whole school year. And since we have a bunch of children here, I wanted to stress that point. It might be nice to have an extra day off school every now and then, but if your school is closed for a whole year and you have to stay home with your parents—you would be dying to get back to school—just like the Sierra Leonean kids were by April of this year! I am happy to report that Irish Aid programming will continue throughout 2015 with a 40% increased budget, to address both the direct effects of Ebola and those secondary impacts on areas such as food security gender and health. A major focus at the moment is working with the government to support pregnant girls to stay in the education system. To conclude, I would like to stress that we cannot go back to business as usual in our work in Sierra Leone. Lessons will need to be drawn from and applied to future development programming in order to ensure that key weaknesses exposed by the Ebola crisis are addressed. Importantly, the Ebola crisis has exposed significant governance challenges, including corruption and gaps in decentralisation processes. Now is the time for the government of Sierra Leone to make real progress on these issues. But the lessons from Ebola are not just negative. Tonight is about hope and I would like to stress that those of us who have been in Sierra Leone in the past year have seen enormous contributions made by Sierra Leoneans and huge courage demonstrated. We have seen medical students successfully running Ebola treatment centres, army personnel leading direct responses, diaspora coming back to volunteer and communities pulling together and taking control. This does not get enough coverage in the international media, but it is very real. Sierra Leoneans have stepped up and achieved a huge amount in extremely challenging circumstances. The good news from my perspective is that the Irish government is committed to working in Sierra Leone to try to build on those positives exposed during the Ebola crisis, as well as helping to tackle the difficult systemic issues even as we provide vital services in the short term in areas such as health and nutrition while continuing to support Sierra Leone to defeat Ebola. I know that SLIP will continue to work closely with us, guide, advise and support us to promote a strong Team Ireland approach to support the welfare and prosperity of the Sierra Leonean people.